Arguably all businesses today use an ERP system to help them run their business smoothly. There is wisdom in this in that an ERP software can link together many processes that will allow them to optimize costs and increase efficiencies. A company today that does not have an ERP system struggles with getting the entire organization aligned as certain information is only made available to certain parts of the business. In fact, an ERP system is increasingly viewed as a necessity because of the way it provides a wide variety of functionalities that span across departments. For example, finance, sales, marketing, inventory management, project management, and logistics among other things. Then begs the question, if an ERP software can link processes within finance or accounting, why do you need an add-on software meant specifically for certain processes such as financial reporting or financial budgeting or even business forecasting? A specialized budgeting and reporting software like Performance Canvas Financials usually uses on line analytic processing (OLAP) cubes that is great for accommodating multi-dimensional queries in contrast to an ERP system that is based on on line transaction (OLT) data approach. In finance or accounting, it is important to identify emerging trends in the horizon because this will be important when forecasting or simply when analyzing. ERP falls short in the fact that it focuses too much on detailed transactions and not so much summary of data or trends. A culture of working from home or accessing information when needed demands that data must be accessible 24/7 and using mobile devices. ERP unfortunately was never designed to be mobile. 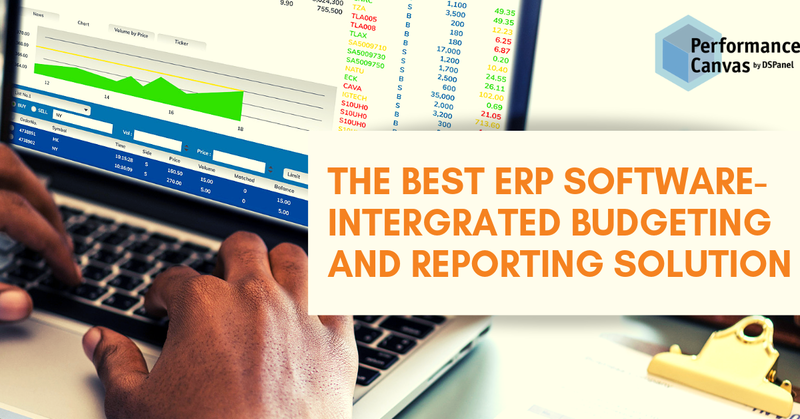 Sure, some ERPs can have mobile apps for certain tasks like expenses but when we talk about creating reports for example, ERP cannot handle this just yet. ERP systems come with budgeting modules and certain report templates, but the truth is that it is so easy to outgrow these. More importantly, these aren’t the focus on an ERP system either. The good thing with an add-on FP&A software like Performance Canvas Financials is that you can be guaranteed their focus I 100% on improving the budgeting, reporting, and forecasting process. This means that the latest best practices in these arenas are constantly incorporated in the solution allowing the organization to continue to improve. If you have ever tried creating a report using the ERP system, you will understand that this is a herculean task. It is error-prone, it is time-consuming, and it requires advanced skills. In contrast, creating reports in specialized FP&A software that serves as an add-on to an ERP system is literally a click away. Performance Canvas Financials is a great FP&A add-on to your ERP software regardless which brand you are using. Performance Canvas Financials is ERP system agnostic which means it can integrate or work with any ERP system in the market. In addition, this complete FP&A software is cloud-based and is affordable. You can even try it out for 30 days for free. Visit www.performancecanvas.com or email info@dspanel.com to request a free trial or to request an online demo to see its capabilities.